Note: This blog post was previously published on In Homeland Security. This past Saturday, my coworker and I drove to Arlington National Cemetery to participate in Wreaths Across America. 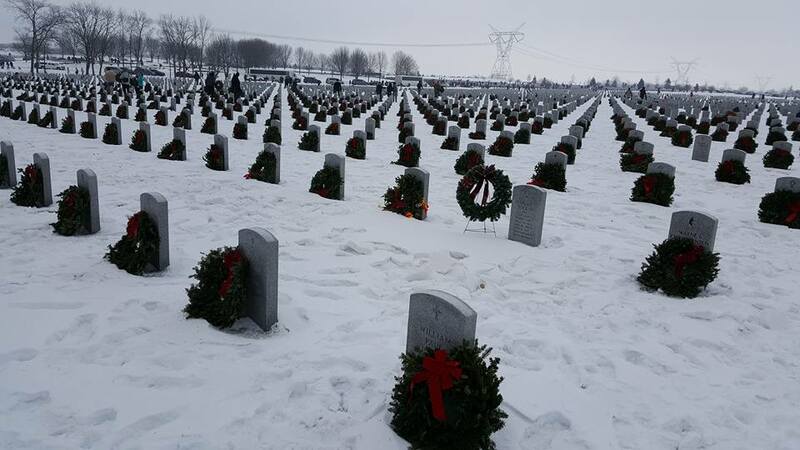 On this day, hundreds of volunteers across the country placed 1.2 million Christmas wreaths at military gravesites in over a thousand locations. From previous experience, I knew that all of us faced a formidable task. 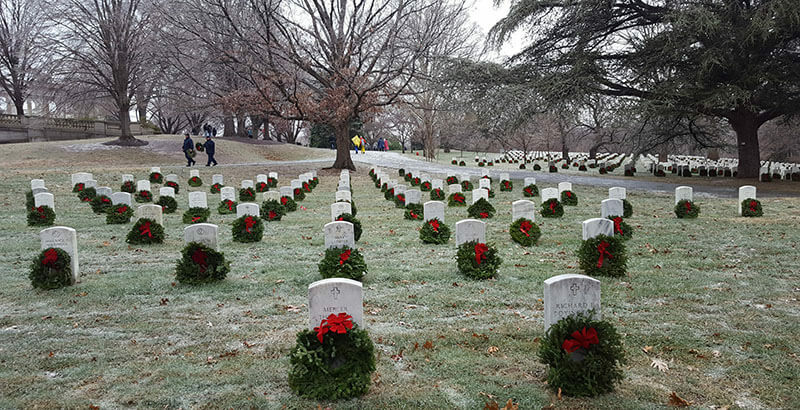 Over 245,000 wreaths were to be laid on Arlington’s graves. It was sleeting all morning, the type of freezing rain that formed a slick layer of ice on roads, coats, ponchos and backpacks and made the cemetery grass sound crunchy underfoot. After our arrival and check-in, we walked to the amphitheater where our zone captain thanked us for braving the elements to get there. After our security and safety briefing, we made our way cautiously over Arlington’s sloping and slippery paths. 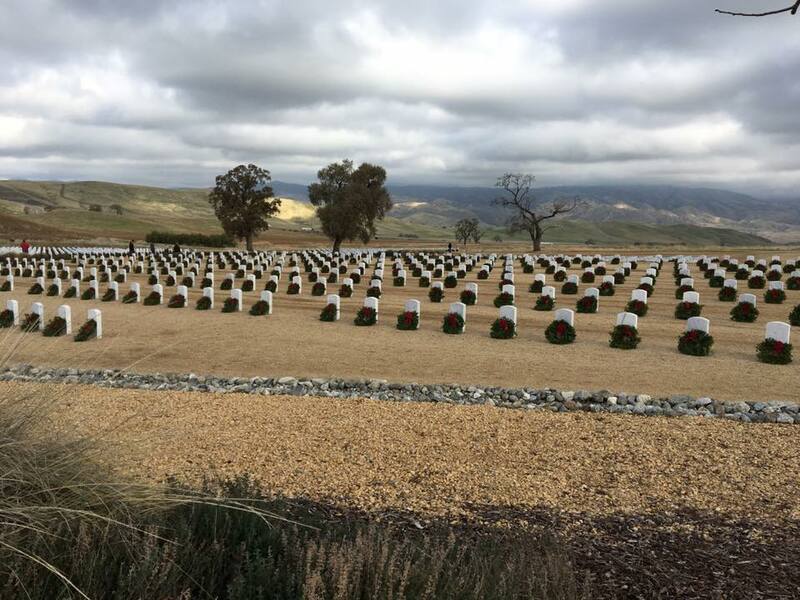 We went to section 7a, where our two trucks packed with over 7,500 wreaths awaited us. In all, there were 65 trucks parked around Arlington National Cemetery, filled with boxes of wreaths. While I waited for the trucks to be opened, there was time to look around and reflect. Arlington National Cemetery is a site that offers magnificent views, but it was also a sobering reminder of the human cost of war over two centuries. There was a large crowd at the truck closest to me. Some people were staff members like me. Other volunteers were students, faculty and alumni from the American Military University or American Public University communities. 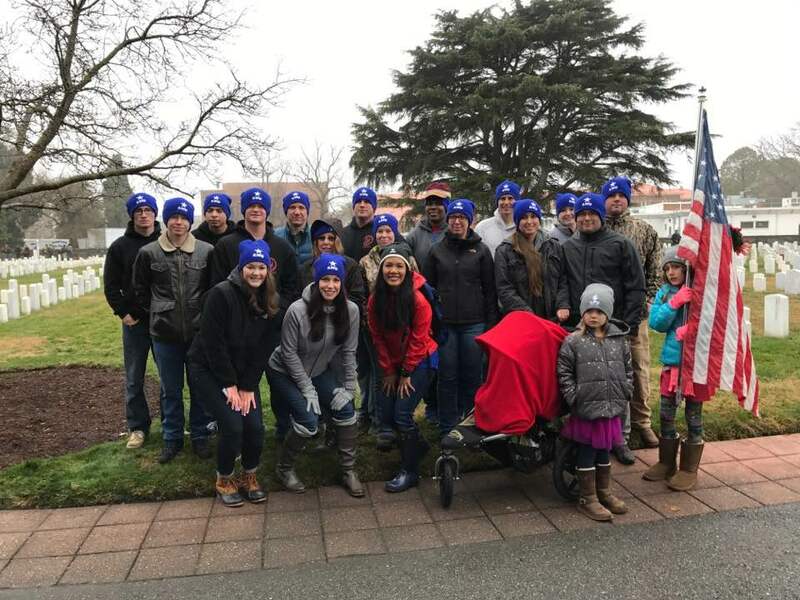 We were part of a group of almost 1,000 volunteers who helped to lay wreaths at 32 different locations nationwide to pay tribute to military servicemembers and their families. Each of these graves contains someone’s husband, wife, mother, father, aunt, uncle, cousin, grandfather, grandmother, brother, sister or friend. Some of the volunteers today personally knew the people buried here and asked to lay a wreath on a particular grave. In deference to the wintry weather conditions, we bypassed the usual opening ceremony and flyovers and went straight to wreath distribution. Our volunteers unloaded boxes from the trucks. Opening them, we could smell the fresh pine wreaths decorated with cherry red ribbons. I took up my station as a ground guide and showed people what areas needed coverage. We started at the far end of each row of gravestones and worked our way back to the starting point, methodically covering each of our appointed sections. Wreaths Across America attracts people from all walks of life. I saw many people in clothing representing different services – Army, Navy, Marines and Air Force. There are also sheriffs, groups of Boy Scouts, military auxiliary organizations and historical re-enactors dressed in period military clothing. Many volunteers were local, but not all of them. I chatted with one woman who told me that she flew here from Ohio to help. Others have come here from other states, such as Maine, Florida, Illinois and Michigan. As they distributed wreaths, people paused, read the name on the gravestone and gently leaned a wreath on the front of each gravestone. One older man lingered a little longer at a gravesite, keeping a brief and lonely vigil before offering a salute and turning away. I wonder at the backstory there – was the person in that grave a military pal? A relative? Even young children helped by carrying a wreath or two. I saw them listening attentively while their parents teach them about what’s on that gravestone and why it’s important. As I departed, I stopped to take a look back at the rows of gravestones and wreaths, and thought about the people buried there. They may be gone now, but once they existed with their hopes, dreams, bravery, disappointments and joys. They will never be forgotten.